Is the ocean really just a big pool? Growing up in Southern California, you begin to wonder why some people insist on swimming in the pool when the ocean is so appealing. Have you seen how beautiful California beaches are? The weather is one of the biggest obstacles to beach swimming. Rain is the beach-goers greatest enemy. It is not because it is wet, because who would care when you are in the water. The real reason is because it is UNSANITARY! That’s right. After a rainstorm all of the garbage and gross gutter trash has been washed down the storm drains and into the ocean. This is why most officials will ask you to wait 72 hours after the rain before you go back into the water. I should mention that going to the pool can also get pretty rugged. Remember our earlier article about chlorine? If you are smelling a strong chlorine smell it means the pool is dirty. On top of that 17% of people pee in the pool and only 35% of people shower before diving in. Swimming out in the ocean adds a whole new element to your swimming experience. Mother Nature makes sure that the ocean has added resistance to your work out. I can verify this. Swimming in the waves is delightful until you get out. All of that resistance to the wave currents wears you out. Suddenly you realize how exhausted you are- that is why so many people fall asleep on the sand. Mother Nature’s waves are great for lots of things, but they are also crazy unpredictable. 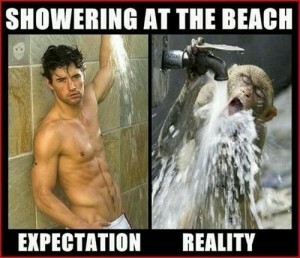 Swimming at the beach is then unpredictable. If you find yourself getting caught up in some strong waves or a riptide it is best to remember a few things. First, remain calm. Start swimming parallel to the shore line. Currents are designed that you can actually swim to a place where they are less powerful and this is how you can get out of the sticky situation. Just go with the flow of the waves and let them carry you in to shore once you have gotten out of the danger zone. Waves can be fun, but they bring in all types of monsters. Experiencing the unpleasant sensation of seaweed wrapping around your legs which you then think it is a jellyfish happens to just about everyone at the beach. You have to keep an eye out for all sorts of things that are capable of harming humans including jellyfish, sting rays, sharks, or even crabs! The pool is a less wild setting. You simply need to avoid child water wings, geriatric synchronized swimmers, and pool noodles.. Both beaches and pools have their exclusivity and their crowds. Where I am from, the beaches are COVERED in people, surfers, kids, and sand. You have to find hidden beaches or private beaches to avoid taking a surfboard to the head while you swim. Getting onto a private beach illegally is easier than sneaking into a pool. Getting into a private beach legally is harder than joining a private pool! You don’t see the surfers, but some gym pools can be equally crowded. They have designed swimmer etiquette to accommodate multiple swimmers in one lane. While they are great for working out, sometimes I feel so claustrophobic in the lanes. It is almost like you have been caught up in some fisherman’s net! Trying to pass someone in the same lane as you becomes this orchestrated dance as you try to avoid each other while also trying to avoid encroaching on another lane full of swimmers. Pool games are very different from ocean games. It really depends on what you like that should determine what is the right swimming venue for you. For the pool, you have the all-time classic game Marco Polo. There is also the ever awesome Categories game where you try to race against your friends. Lastly, there is the Treasure Hunt game where you dive down to the bottom. And of course you have the official pool sport-water polo! These games mainly test your agility and technique in the water. Beach swimming games are quite different, they focus on capturing the nature elements. These games include surfing, body boarding, boogie boarding and the simple dive under the waves. Beach games can be done with others or by yourself. Body boarding is one that everyone should try because it simply requires a bathing suit and some waves. Most ocean games do require patience as you wait for the perfect waves. Ocean or Pool: what is your preference? Are there any things that really set the two apart? Do you have a special beach spot or a hidden gym gem that you think is the best? I want to hear about it all.